Media rooms are a modern concept that allow people to sit and watch their favourite movies in the comfort of their own homes. It can also be known as a cinema room or a television room as they usually have a television or projector screen on the main wall of the room. They are wonderful spaces that enable people to get together and really enjoy some quality entertainment. 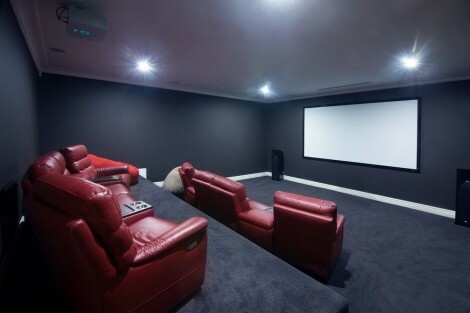 There are a variety of different ways to set up your own cinema room with so many options available for lighting and seating arrangements. Whether you are after a social space for you and your friends, or purely want a space for yourself to relax and unwind, then this category will provide you with all the inspiration you need to make your dreams become reality. It will give you some great ways to make your media room a more open and inviting space, whilst helping you choose colours and furniture to make it look fantastic! As you look through the images in this category, you will find some wonderful examples of media room designs, from elaborate and modern to simple and comfortable, all of which fit their own desired requirements. You will find photographs of media rooms that make the most of their space by filling it with large comfortable seating arrangements, and others that make the most of the wall space by installing huge screens and dimmed lighting. This category will give you with some great ideas and inspiration which will help you to choose the right kind of layout and design for your own media room. There are some very understated designs that focus more on the design than functionality, and some larger, minimalist designs that hone in on the usability and purpose of the media room. One of the main considerations to take into account when thinking of media room design, is the purpose and functionality of the room. Firstly, it needs to stand the test of time as a media room before embellishments and design features can be added to improve its aesthetics. This ensures that there has been adequate thought about the needs of the media room and what you want to achieve from its presence. This category will help you think of new ways of tackling your needs, and will provide you with wonderful examples of how to make your newly planned space look and feel perfect for you. Whether you are looking to create your first media room, or simply want to refresh and revamp your existing one, then this category has plenty of ideas to make your wishes come true. There are lots of images to look through, with each one giving you a new take and different direction to consider. There are also keywords attached to each image so you can find out more about certain styles or ideas.